Hands up if you feel awful and disgusting and regret almost everything you ate this Easter. Good, so not just me. I feel like it was an endless cycle of drinking and eating with not much physical activity aside from walking to the esky for another beer. 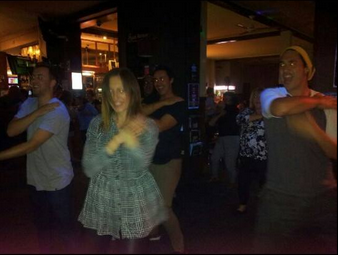 Doing the macarena was the closest I came to doing exercise. Not sure if it’s still a healthy activity after three jagerbombs though. I think I went way too YOLO this year and ended up feeling pretty crap every day from the amount of chocolate and alcohol I was consuming… and paid for it when I stepped on the scales when I got from the long weekend. The Easter Party with my family. That’s me gorging on kids party food in the background. I’d glad you can’t see what’s on my plate! Back at work, I had four days of exercise and eating really well, and then tonight, my boyfriend decided he wanted pizza for dinner. I made myself a healthy snack and told him I’d have a bite. But the pizza came and it looked soooo good so I just had a peice. And then I had another without really thinking. And then I started doing the dishes and noticed it just sitting there. I started taking little bites until I’d eaten a THIRD PIECE. The psychology is pretty amazing I think. After two pieces I still felt ok; I had still gone to the gym and was having a generally healthy day. Still in an ok mindset…. But the third piece turned me into a savage. Now that I’d officially gone overboard, I figured I might as well throw it all out the window and eat more crap – and how convenient that we had a stash of Easter eggs in the pantry! I know I can’t blame the holiday and it’s all my responsibility, but man it’s hard getting back into it. Tomorrow, I’m taking all the leftover chocolate in my possession (tom won’t let me take his) to work to GET RID OF IT. This is one of those blogs where I’m the one looking for advice. How did you handle the Easter long weekend, and what are you doing to make up for it/ get back into a healthy routine? Previous Post Jump outta bed… and work it like an animal! Holidays can be the worst for de railing progress! I worked all weekend but still managed to justify too much Easter Candy! I think it is just a losing battle and the best we can do is get back to normal ASAP after the festivities wrap up! As Long as you had fun it is ok. You do not have to be perfect or feel guilty for enjoying life. Just get back onto healthy eating and exercise and you will feel healthy and vibrant again.